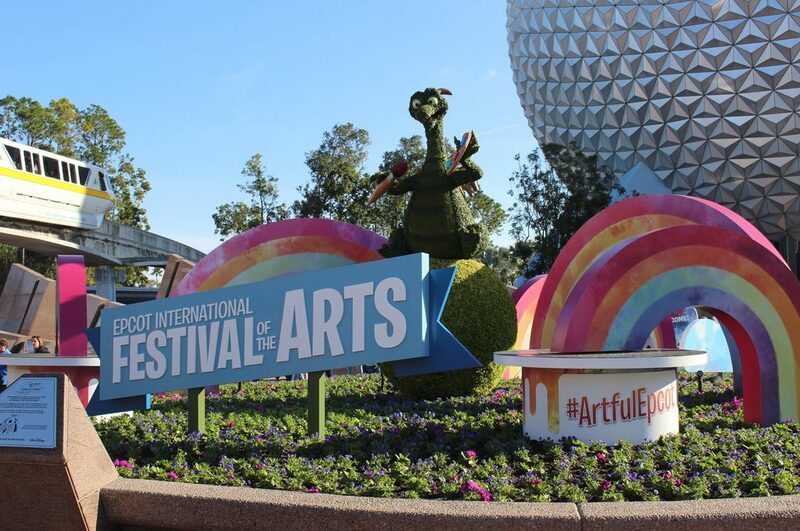 Epcot’s International Festival of the Arts added an extra pop to our January visit. Running every day until February 19, the festival gave us more than usual to do, see, and eat. 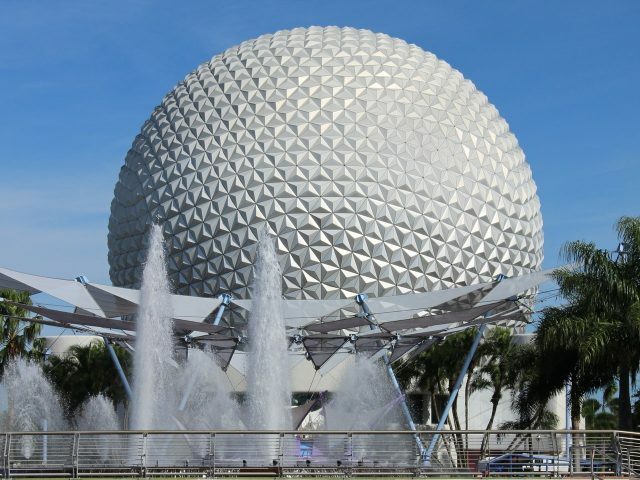 The truth is, we couldn’t get to it all in one day AND do all our regular Epcot favorites (Soarin’, Club Cool, Test Track, Via Napoli, Les Halles Boulangerie-Patisserie, Agent P, Spaceship Earth, Living with the Land, and Mitsukoshi), so we concentrated on visiting the artist booths this trip. Our first stop was to the booth of Greg McCullough, creator of the official festival poster and so much more. McCullough’s career includes stints at both Disney and Pixar. During our visit, he spent a lot of time chatting with us about his experiences as a self-taught artist. Two of his pieces really stood out. 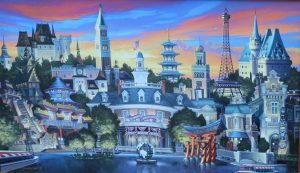 The piece created for the poster was difficult to walk away from as it features all 13 World Showcase country icons and 35 hidden Mickeys. Can you find the 13 icons and 35 hidden Mickeys in this piece by Greg McCullough? 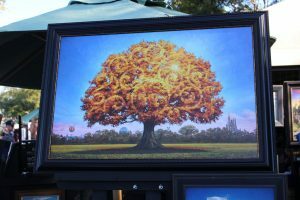 Equally stunning, however, was his painting of a large tree. 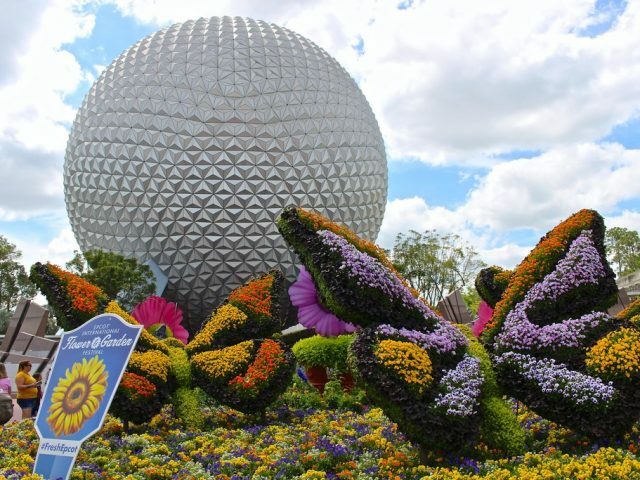 The tree—similar in majesty to the Tree of Life—blazed with a crown of golden-hued leaves that swirled in the center into that famous Mickey symbol. In the distance, McCullough added a nod to each park and Disney Springs. With the parks in the distance, this tranquil tree was bursting with sunlight. Our next stop—to the booth of Orange County native Noah—cast an entirely different vibe. His sepia-toned works of kids and characters enjoying favorite Disney attractions were hard to resist. (Check out the piece called “Yeti-Or-Not”.) We loved that Noah was on site as well, chatting up festival goers and signing prints. We wanted to know more about this unique artist, so we checked his bio. Not only has he partnered with Disney to create “Noah” versions of the characters we saw at Epcot, his work is also used for Vinylmation. We revisited our favorite booth from 2017—the Fairy House Ladies. 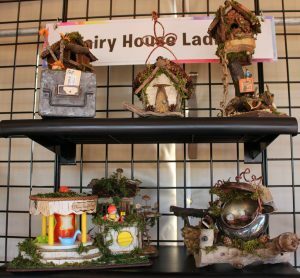 They did not disappoint with their whimsical fairy homes made out of nostalgic toys, discarded metal, and natural materials. The ladies even had a story to tell. That very morning, they arrived to open their booth and heard the sound of a music box coming from inside. When they entered, a toy carousel used in one of their creations was playing. Had a fairy just left the premises? The Fisher Price carousel in the bottom left corner was playing when the Fairy House Ladies arrived that day. 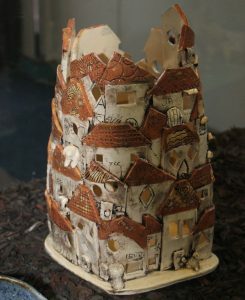 This clay sculpture collaboration called “Village Luminary” was made by Crealde’s summer campers. 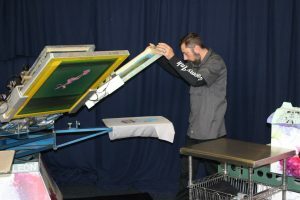 While visiting the show, we also stumbled upon the folks from Enemy Ink, who were printing official festival t-shirts. They let us pick out a shirt and a design, and then they printed up a tee for us on the spot. It was a very neat experience and souvenir. The guys from Enemy Ink printed up a shirt for us on the spot. So that’s our rundown of the art highlights. Really, it’s just the tip of the iceberg. 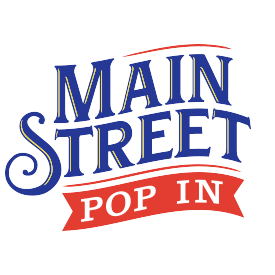 There is so much more to see: living statutes, workshops on everything from photography to latte making, chalk art, special Disney on Broadway weekend performances, a Figment scavenger hunt, step-into-the-art photo ops, mural painting, and dozens of booths offering wildly creative food and drink. We declare the 2nd Annual Festival of the Arts a big hit. Join our subscriber list and get exclusive content every Monday.